A variety of pre-designed blocks of text and formatting, known as Building Blocks, are available for easy insertion in Word. 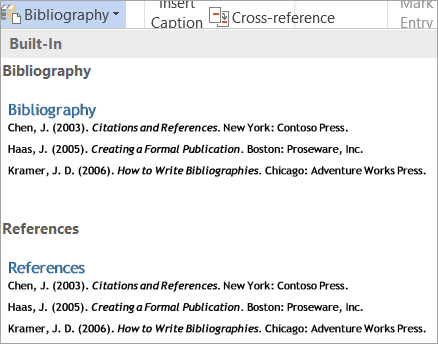 Building Block galleries are available throughout Word, and they include preformatted Headers, Footers, Page Numbers, Text Boxes, Cover Pages, Watermarks, Quick Tables, Tables of Contents, Bibliographies, and Equations. The built-in Building Blocks are theme enabled, which means that if you modify the document theme, the formats automatically update—even in the Building Block galleries. You can customize Building Block entries to fit your needs, and you can create custom Building Blocks and add them to their relevant galleries. You can view the many Building Blocks by browsing the various galleries (most, but not all, of which are located on the Insert tab), or you can check out the entire collection at once by opening the Building Blocks Organizer, found by clicking Insert > Quick Parts. 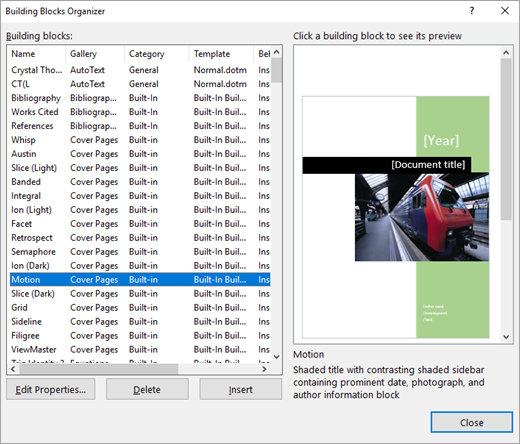 While viewing a Building Block gallery, you can quickly locate a Building Block in the Building Blocks Organizer by right-clicking a Building Block, such as a Cover Page or a Header, and then clicking Organize and Delete. The Building Blocks Organizer opens with the entry selected automatically. 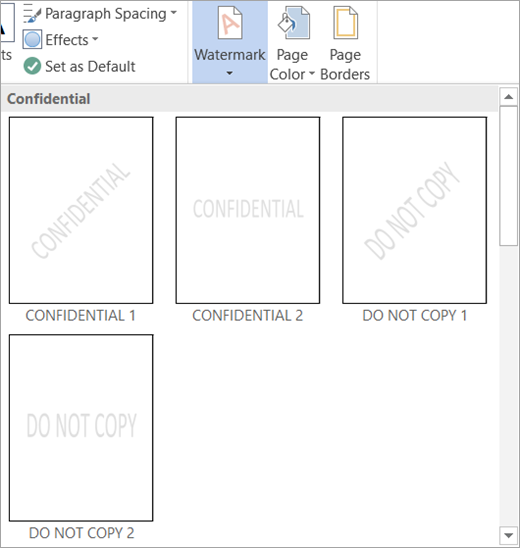 You can insert a Building Block in a document by clicking the Building Block on its corresponding gallery (such as the Text Box gallery available on the Insert tab). 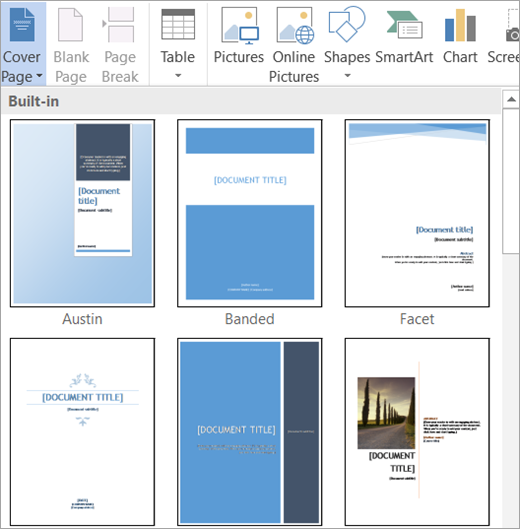 Here are a few of the Building Block galleries that you'll find in Word. 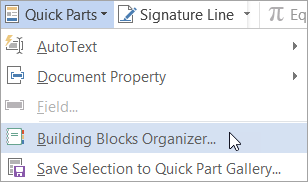 Alternatively, you can use the Building Blocks Organizer to preview and insert a Building Block in your document by clicking Insert > Quick Parts > Building Blocks Organizer. Note: If you want to insert Building Blocks by using the keyboard, type the Building Block name in your document, and then press F3. 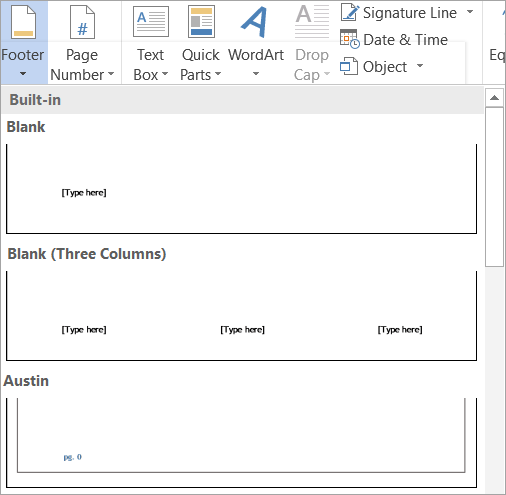 After you insert a Building Block in your document, you can customize the Building Block's formatting and properties without affecting the Building Block stored in the template. Frequently used document content, such as one or more paragraphs of data, logos, graphics, specifically formatted headers or footers, standard tables, or equations, can be easily turned into a Building Block. Select the data that you want to turn into a reusable Building Block. On the Insert tab, click Quick Parts, and then click Save Selection to Quick Part Gallery, or press Alt+F3. The Create New Building Block dialog box appears, where you can name, classify, describe, and control the placement of your Building Block. Tip: If you want to include all paragraph formatting, such as style, line spacing, indentation, alignment, and so forth, select the paragraph mark (¶) along with your content. If you aren't already viewing formatting marks, navigate to the Home tab and, in the Paragraph group, click the Show/Hide ¶ button to toggle the formatting marks so you can verify that you included the paragraph mark in your selection. If you do not include the paragraph mark, the inserted Building Block will match the formatting of the current paragraph. Name Enter a unique name for the Building Block. If you have a set of related Building Blocks, consider starting all of the names with the same first word to group the pieces together when necessary, such as Annual Report Cover, Annual Report Header, and Annual Report Table. Gallery Add your new Building Block to a specific gallery, such as Cover Pages, Page Numbers, Headers, Footers, Quick Tables, Watermarks, and so on. If your Building Block is a general Building Block and isn't related to an existing gallery, use Quick Parts so that they will appear under the Quick Parts gallery. Category Place the Building Block in a category, shown on the Building Block galleries and in the Building Blocks Organizer. Consider creating a new category for your company or department so that all of the associated Building Blocks are placed in the same category throughout the Building Block galleries and to quickly sort them in the Building Blocks Organizer. Tip: To display your Building Blocks at the top of the Building Block galleries, create a Category name that starts with a symbol, such as an asterisk, or place the name in parentheses. Description Provide a brief description to help remind you and inform others about the main purpose of the Building Block. Descriptions appear as enhanced ScreenTips in the Building Block gallery (provided that Show Feature Descriptions in Screen Tip is turned on in Word Options) and also appear below the preview pane when you select a Building Block in the Building Blocks Organizer. Save In Building Blocks can only be saved in templates. You can save Building Blocks in Building Blocks.dotx (selected by default), Normal.dotm, or a global template so that they are available to all open documents. They can also be saved in a document template that makes the Building Blocks available only to documents using that template. The Save In list contains Building Blocks.dotx, Normal.dotm, loaded global templates, the attached document template for the active document if it's a template other than Normal.dotm, and any saved template provided that it is open and the current file. If you are creating Building Blocks to share with others, you want to save them in a separate template so you can distribute them. Options Specify whether the Building Block should be inserted as content only at the location of the cursor (good for content such as equations), inserted in its own paragraph (good for paragraphs or headings), or inserted on its own page (this inserts a page break before and after the Building Block). Tip: Use the Save Selection To Gallery Name gallery found at the bottom of the Building Block galleries to quickly access the Create New Building Block dialog box and automatically select the corresponding gallery in the dialog box. Right-click a gallery item and choose Edit Properties. 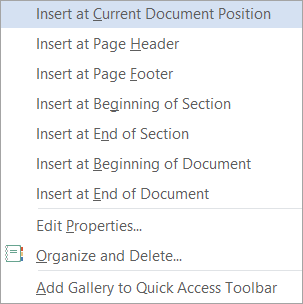 Click Quick Parts on the Insert tab, click Building Blocks Organizer, select the name of the Building Block in the organizer list, and click the Edit Properties button. After you open the Modify Building Block dialog box, make any desired changes and click OK to close the dialog box. A message asks whether you want to redefine the Building Block entry. If you click Yes, the changes are effective immediately. You can also redefine a Building Block, such as changing the content or formatting. Simply make your modifications and select the content. On the Insert tab, click Quick Parts >Save Selection to Quick Parts Gallery, or press Alt+F3. In the Create New Building Block dialog box, type the same name as the Building Block that you want to redefine and make any other necessary changes, such as changing the gallery or category. When you click OK, you are prompted with a message asking whether you want to redefine your entry. To delete content created by inserting a Building Block, simply delete the content as you would any other content. 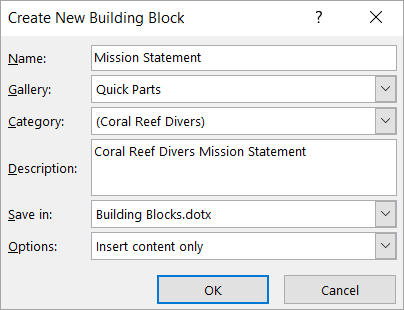 To delete a Building Block entry, select the Building Block in the Building Blocks Organizer (Insert > Quick Parts > Building Blocks Organizer) and then click Delete.